There are many series, suites and cycles of pieces which can be considered "up there" in the pianist's standard repertoire: Bach's '48', Schubert's Impromptus and Moments Musicaux, Schuman's Carnaval and Kreisleriana, Chopin's Etudes and Preludes, Liszt's Années or the Transcendental Studies, but none can quite come close to Beethoven's 32 Piano Sonatas, usually referred to as the 'New Testament' of piano music (the WTC is the 'Old Testament'!). Perhaps the primary appeal of these pieces, aside from the sheer Herculean effort of learning and absorbing them, is that they offer both a far-reaching overview of Beethoven's musical style and a glimpse into the inner workings of his compositional life and personality. Urban legend has it that Beethoven was a rough, irascible, grumpy and unapproachable sod, but this does not tell us much about his music. Living with his music, spending time with it to understand what makes it special, allows a more honest, rounded view of him, and, perhaps of all his music, the piano sonatas offer a really candid autobiography. As pianists, whether amateur or professional, advanced or intermediate, or even just beginning on the great journey of exploration, we have all come across Beethoven's piano music, and many of us have played at least one of his sonatas during our years of study. As an early student, a taster of a proper sonata in the form of one of his Sonatinas (something my father is grappling with at the moment - and refusing any helpful advice from me!). Later on, we might encounter one of the "easier" piano sonatas, such as the pair of two-movement sonatas that form the Opus 49 (nos. 19 and 20), which are roughly Grade 5-6 standard (but don't be fooled by the comparatively "easy" notes!). As part of my Grade 8 repertoire, I learned the No. 5 (Opus 10, No. 1, in C minor), which prefigures the far more well-known and well-loved Pathétique in the flourish of its opening measures, the "beautiful melody" of its slow movement, and its febrile final movement. A quick glance through the Diploma repertoire lists for any of the exam boards (Trinity, ABRSM, RAM etc) and there is a generous handful of sonatas to choose from, from well-known to less popular, to suit each level of Diploma right up to Fellow. It is generally accepted the pianistic wisdom that Beethoven composed the piano sonatas during three distinct periods of his life, and as such, like the Duo Sonatas for Piano and 'Cello (read my earlier post here), offer a fascinating overview of his compositional development. Setting aside the three "Electoral" sonatas, which are not usually included in the traditional cycle of 32 (though Beethoven authority, Professor Barry Cooper, who has edited new the ABRSM edition of the sonatas, argues that there is a case for including the three sonatas that Beethoven wrote when he was 12 in a complete edition), the early sonatas are, like the early duo sonatas (for violin and for 'cello), virtuosic works, reminding us that Beethoven was a fine pianist. While the faster movements may nod back to his teacher, Haydn (though Beethoven would strenuously deny any influence! ), it is the slow movements which demonstrate Beethoven's deep understanding of the capabilities of the piano, and its ability, through textures and colours, moods and contrasts, to transform into an instrument he wishes it to be. Some of the writing could be for string quartet (Op. 2 No. 2). In the early sonatas, Beethoven's mastery of the form is already clear, and many look forward to the greater, more complex, and more revolutionary sonatas of his 'middle' period. His distinctive musical personality is already stamped very firmly on these early works. The 'Tempest' and 'La Chasse' (Op. 30, Nos. 2 and 3). The first with its stormy, passionate opening movement, the second of the opus rollicking and somewhat tongue-in-cheek. The 'Moonlight' (Op. 27, No. 2): the first piano sonata to open with a slow movement. Too often the subject of clichéd, lugubriously romantic renderings, this twilight first movement shimmers and shifts. An amazing gesture, created by a composer poised on the threshold of change. he 'Waldstein' (Op. 53). Throbbing quavers signal the opening of one of the greatest of all of Beethoven's piano sonatas, while the final movement begins with a sweetly consoling melody which quickly transforms into daring octave scales in the left hand and a continuous trill in the right hand. This is Beethoven at his most heroic. 'Les Adieux' (Op. 81a). Suggested to be early 'programme' music in its telling of a story (Napoleon's attack on the city of Vienna which forced Beethoven's patron, Archduke Rudolph, to leave the city, though this remains the subject of some discussion still). It is true that Beethoven himself named the three movements "Lebewohl," "Abwesenheit," and "Wiedersehen". One of the most challenging sonatas because of its mature emotions and technical difficulties, it bridges the gap between Beethoven's middle and late periods. The 'Hammerklavier' (Op. 106), with its infamous and perilously daring grand leap of an octave and a half at the opening (which, of course, should be played with one hand! ); its slow movement of infinite sadness and great suffering; its finale, a finger-twisting fugue, the cumulative effect of which is overwhelming: an expression of huge power and logic. The Last Sonatas (Opp. 109, 110, 111). I have written about these sonatas previously. They are considered to be some of the most profoundly philosophical music, music which "puts us in touch with something we know about ourselves that we might otherwise struggle to find words to describe" (Paul Lewis), which speaks of shared values, and what it is to be a sentient, thinking human being. From the memorable, lyrical opening of the Op. 109 to the final fugue, that most life-affirming and solid of musical devices, of the Op 110, that peaen of praise, to the "ethereal halo" that is contained in some of the writing of the Arietta of the Op 111, the message and intent of this music is clear. And this is Beethoven's great skill throughout the entire cycle of his piano sonatas. So, what is the perennial attraction of performing a Beethoven Sonata Cycle? Glance through concert programmes around the world and it is clear that these sonatas continue to fascinate performers and audiences alike, and no sooner has one series ended than another begins, or overlaps with another. Playing the Sonatas in a cycle is the pianistic equivalent of reading Shakespeare, Plato, or Dante, and for the performer, it offers the chance to get right to the heart of the music, peeling back the layers on a continuous journey of discovery, always finding something new behind the familiar. One does not have favourites; just as when one has children, one should never have favourites, though certain sonatas will have a special resonance. The sonatas are like a family, they all belong together - and they are needed, ready to be rediscovered by each new generation. You can play the sonatas for over a quarter of a century, half a century, and yet there are still many things in these wonderful works to be explored and understood, things which still have the power to surprise and fascinate. Every pianist worth his or her salt knows that presenting a Beethoven sonata cycle represents a pinnacle in one's artistic career (ditto the five Piano Concertos) and an important stepping stone to other great cycles (Schubert's sonatas, for example, which are, perhaps, less satisfying to play than Beethoven's because of problems such as incomplete or different versions of the same work), but once a cycle is complete, one cannot truly say one has conquered the highest Himalayan peak. And that is what is so special about this music: you can never truly say you have "arrived" with it, while its endless scope continues to reward, inspire and fulfil. I have never heard a complete Beethoven cycle performed by a single performer, but I have heard plenty of concerts which form part of the whole: in the 1980s, it was John Lill, now one of the "elder statesmen" of British pianism; before him, my parents would have heard Brendel and Barenboim. Following in their footsteps, I heard some of Barenboim's concerts when he played a complete cycle at the Festival Hall three year's ago. At the same time, Paul Lewis was just finishing his own cycle at the Wigmore Hall (and beyond). I heard him play Nos. 15-18, some of the early sonatas, and the Last Sonatas. Then there was Till Fellner, a young Austrian with a clean, fresh approach, whose cycle began in 2008. On LP, I had Lill's complete cycle, released the same year as I heard him at RFH. On CD I have Arrau, whose account is hard to match. But I also have recordings of favourites, such as the Opus 10's, played by Angela Hewitt, or the Opus 110 (my absolute favourite), played by Glenn Gould and Mitsuko Uchida (whose Mozart playing I adore). In concert, the sonatas are presented in halls large and small, famous and lesser known. The size of the hall can affect one's appreciation and understanding of the works. For example, sometimes the earlier sonatas, which were written for the salon, can be lost in a venue as big as the Royal Festival Hall. One's connection to the music is also affected, of course, by the performer. Lill, I remember, brought an extraordinary closeness and intimacy, something I have never forgotten, a sense that it was an entirely shared experience; while with Barenboim it felt as if an invisible barrier had been erected between us, the audience, and him the performer (I suspect he neither intended nor engineered this; rather, the over-awed audience brought it upon themselves!). Beethoven's Piano Sonatas: A Short Companion - Charles Rosen. A very readable analysis of all 32 sonatas by respected pianist and writer. There were two times in this century. The first era was called the baroque era. This era was around 1600 to 1750. Baroque was the beginning of modern music because it has experienced the revolution from both theory and technique of its cultivating. The key characteristics of this era included the merger of major and minor scales, many dissonant tones, the development of the orchestra, and the regular structures, but monotony. They also included the use of violin, harpsichord, organ, and flute. In this era, people also knew the basso continuo technique, namely the bass accompaniment that brought harmony. There was repetition in the structure of music. Composers who lived in this era were Johann Sebastian Bach, Georg Friedrich Handel, Antonio Vivaldi, Claudio Monteverdi, and Henry Purcell. The second era was called the classical era. Sonatas and chamber music grew with more dynamic melodies. All of the classical era rules were applied intelligently by the composers. The key characteristics of this era were the development of musical harmony, a very strong element of the dynamics that colored the composition, and a dynamic atmosphere that was expressed through the tempo, melody, and harmony. In this era, people also knew the pattern of 'question and answer'. Piano, with its ability to create dynamic, became a very important instrument. The popular composers in this era were Wolfgang Amadeus Mozart, Franz Joseph Haydn, and John Gay. This period represented the transition time from classical music to romantic music that was initiated by Beethoven. He brought a dynamic element by using wider harmonies and more emotional techniques of music cultivating. This period was called as transitional because there were some principles of classical era that were violated by Beethoven. For example, the use of the intro was considered to be the outside of the classical composition theory. However, it was precisely a characteristic of romantic music. Through his works, Beethoven influenced the transition of classical to romantic music greatly. There are many famous instances of immortal musicians being insulted by other famous musicians. Johann Sebastian Bach, like most musicians of the day, worked as a church musician. He was anything but docile and was known to rankle easily. He was once reproved for playing "strange harmonies" during a church service. Bach's answer was to play even stranger harmonies the next Sunday, and this from the greatest composer of religious music the world has ever seen, the composer of the St. Matthew Passion. Still steaming, the elders complained again to Bach and added the insult that the music was at some points "too long." The next Sunday, of course, the music was much too short. Beethoven also had his feuds, especially in the early years when he was establishing himself as a great pianist. A worthless popinjay named Steibelt had made it known that he thought Beethoven a terrible pianist, and in essence challenged Beethoven to a musical duel, a common occurrence in those days. Beethoven despised Steibelt, for he was in truth a talentless oaf that foolishly dared to challenge a great master. At a party the next week, Beethoven heard Steibelt playing one of his own compositions, an insipid Trio for piano, violin, and cello. It was the type of horrid, elaborately ornamented fluff that Beethoven reviled, but he watched calmly as Steibelt finished the piece and took his bows. A hush fell over the crowd as Beethoven appeared out of the shadows and walked toward the piano. Everyone was aware of the grudge between Steibelt and Beethoven and the air was thick with apprehension. Steibelt, startled by the angry look on the master's face, stepped away from the piano. As Beethoven walked past the cello's music stand, he snidely grabbed the cello's sheet music. Carefully showing the astounded crowd the page of sheet music, Beethoven sat at the piano and then put the music, upside down, onto the piano music stand. As Steibelt and the hushed crowd watched, Beethoven plunked out the notes of the upside down cello part, forcefully jabbing with his pointed and angry index finger, not taking his eyes off Steibelt. Then Ludwig began to improvise like a madman on Steibelt's upside down cello part theme. The crowd was carried away with Beethoven's angered showmanship. And it was magnificent, one of those legendary Beethoven improvisations that have gone down in history, a passionate outpouring of ideas and bravura, until at last the piece was over with a furious ending and crash. Curiously, Steibelt was never heard from again. By John Aschenbrenner - Copyright 2000 Walden Pond Press. Visit http://www.pianoiseasy.com to see the fun PIANO BY NUMBER method for kids. There are three collections of bagatelles by Beethoven: "Seven Bagatelles, Opus 33", "Eleven new bagatelles, Opus 119" and "Six bagatelles, Opus 126". They originate from his time in Bonn, were probably originally intended as middle movements for sonatas but presumably considered by Beethoven in the course of the work on those compositions as too light in character. To determine the origin and the dating of the Bagatelles are not altogether easy. As with many works of Beethoven the opus numbers themselves do not lead to a secure dating of the composition. Beethoven set the opus number only on the occasion of a publication. But even with extensive works the publication followed by no means immediately after the completion. For example, the big string quartets Opus 130, 131, 132 in A minor: Opus 132 the oldest, with Opus 130 following. Besides, between the first design and the completion of single works with Beethoven often years lay, and the composer was known as very economical in regards to ideas, which he now and again after long breaks took up again, an exact dating especially of the smaller pieces, who filled the breaks between larger works, is especially difficult. The bagatelles Opus 33 were published in 1803. The autograph carries the label "par Louis van Beethoven in 1782", therefore, one could presume, the whole work still belongs to the early years, Bonn. However, the authenticity of the label is questionable, sketches are found for the first and sixth part next to sketches of the oratorio "Christ on the Mount of Olives" (composed in 1801, first performance 1803) and to the Symphony No. 2 in D major (composed in 1801/02, first performance 1803). Thus, even without a critical review, it can be supposed that the bagatelles of Opus 33 belong mostly to the years of 1801 and 1802, nevertheless, single parts appeared or were sketched before. The contemporary criticism did not receive the collection particularly benevolently. The only preserved report refers to the name "Bagatelle", with contemptuous poignancy: "Do earn this title in the farthest sense of the word". More difficult still is the exact dating of Opus 119. Already Hans von Bulow, to whom still no reliable research material was available, doubts in his Beethoven edition the statement of Schindler that these bagatelles were written around the time of the Missa Solemnis in 1822. "We are not able to believe to this insurance so absolutely: to us these sketches seem to come from a different era, even if the majority, this some special peculiarities leads one to believe, belong seem to belong to the so-called last period." Bulows assumption has proven right. Single sketches of Opus 119 are already found in 1801, mixed with some of Opus 33. The whole collection is made up of two different groups: No. 7-11 appeared first in 1821 as a contribution to the "Viennese Pianoforte School" compiled by Friedrich Starke, further sketches are found together with sketches of the Sonata in E major, Opus 109, of the Benedictus and the credo for the Missa, belong to 1820. No. 1-6 were finished two years later. The remaining parts are probably treatments of sketches from 1800-1804. The history of the "Six bagatelle Opus 126" and their origin are indisputable. The sketches are from the year 1823 and are found besides those to the Quartet in A minor, Opus 132, and to the final choir of the Symphony No. 9. Bülow wrote: "Bezüglich dieses letzten Heftes glaubt der Herausgeber auf Grund der darin ersichtlichen charakteristischen Stileigentumlichkeiten versichern zu konnen, dass sie sämtlich aus der spätestens Schaffensperiode des Meisters stammen, was bei dem vorangehenden Hefte Opus 119 in Abrede gestellt werden musste." (Regarding this last collection, the publisher believes on grounds of the style characteristics to be able to affirm that it originates from the last period of the master, something that cannot be said for the preceding collection Opus 119." 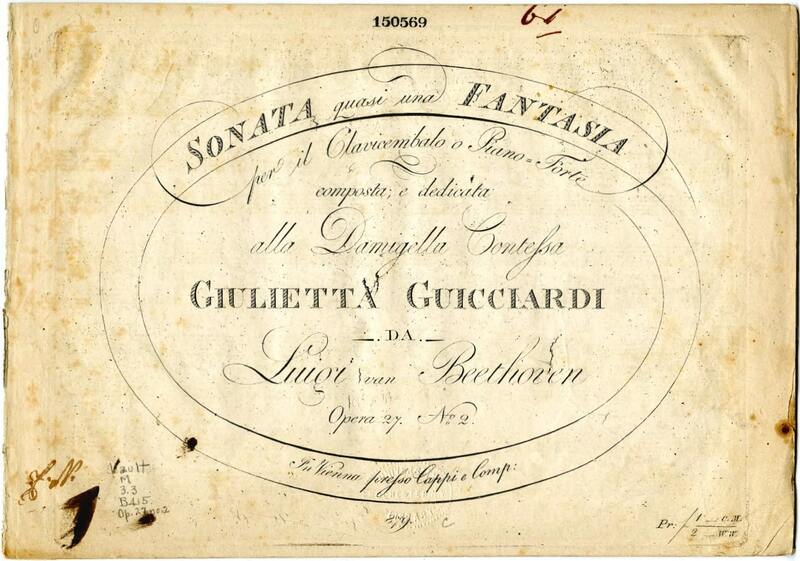 ‘Sonata quasi una fantasia’ is the title Beethoven gave his fourteenth sonata. Unlike the formal Sonata form of the classical period, Fantasia commonly describes a free-form classical musical piece. Marking the beginning of Beethoven’s second stylistic period, opus 27 no. 2 does not follow the traditional sonata form. Beethoven additionally uses traditional musical mourning devices called Trauermusik, in a very untraditional way. Trauermusik consists of Lament Bass, repetitive accompaniment figures, and chant. Other famous examples of chant are Mozart’s Masonic Funeral Music and the Requium. Dotted monotone anacrusis permeate the first movement reminiscent of the tolling of funeral bells, recall the previous piano sonata Opus 26, Marcia sulla morte de’un eroe, which anticipates Chopin’s opus 35 Bb sonata’s famous ‘Marche Funebre’ and later the main theme of Beethoven’s ‘Eroica’ Symphony’s ‘Marcia Funebre’. What changes in Beethoven’s life led to these transformations in his music? In 1800-1802 Ludwig van Beethoven experienced devastating internal turmoil in trying to come to terms with his hearing loss. To the outside world, his life seemed to be ideal, with his success as a virtuoso pianist and as a successful, sought-after composer in Vienna. He gradually began to withdraw from society and friends, however, as he felt it would be detrimental to his successful career as a musician if people found out he was going deaf. People felt he was being misanthropic, yet it was quite the opposite. Beethoven lived in a great deal of solitude and loneliness due to his impending and eventual complete deafness, which would eventually have a profound effect on his spiritual and creative growth as a composer and a musician. The years of 1800-1802 were a transformative period in Beethoven’s life and marked the beginning of his second stylistic period. As Beethoven’s outer hearing deteriorated, his inner hearing continued to grow. Over and over in Beethoven’s music themes of victory over tragedy abound. In the internal struggle he faced, although his music showed the greatest despair and sorrow, it always transcended into a triumphant victory. With that same inner struggle, Beethoven learned to transcend deafness and still be victorious in creating greater and greater masterpieces. During the late 1790s, Beethoven’s music began to show changes, as well as enlargement of form. After the Heilgenstadt Testament, Beethoven expressed dissatisfaction with his compositions and according to Czerny was “determined to take a new path.”  The changes included strong links between sonata movements, intensified drama, harmonic instability, motivic elements affecting the larger form, twelve measure structures, registral gaps, recitative and pedal effects. This sonata could be interpreted as Beethoven beginning to come to terms with his impending eventual deafness. The mourning and loss of the Adagio Sostenuto with its modal changes, dissonances, rhythms, and chants representative of Trauermusik followed by the rage of the stormy third movement, were his way of expressing how he felt about this affliction of deafness while writing the most extraordinary music and not being able to hear it. Born in 1770, Ludvig van Beethoven was one of only three of his parents’ seven offspring children to survive infancy. Yet the world of music owes this chance event an immeasurable amount because he would go on to be one of a handful of composers to grace the art form with a style and quality that is truly unique. His father was his first music teacher, a proficient tenor, and his grandfather on the paternal side had been Kappelmeister at the court of Clemens August of Bavaria. Music was in his blood, and he started playing viola and organ at a very early age, although he was not a prodigy in the Mozart mold – despite his father’s attempts to declare that Ludwig was seven for an early performance when he was in fact nine. However, he was certainly a talented youngster and published his first three piano sonatas in 1783. He died in 1827 and it is said that as many as 30,000 people attended his funeral procession. Beethoven’s genius is merely underlined by the fact that he started to lose his hearing in his late twenties, yet continued through intense frustration and anguish to compose some of music’s most complex and beautiful pieces. For the historian and student of his music, however, the composer’s deafness created a unique opportunity to appreciate the composer. Because he could not take part in an oral conversation, he would carry with him notebooks and have conversations with people in writing. These people could be performers, conductors, students or masters, and the notes survive today to give a unique insight into not only the man, but his art, too – among his notes are specific instructions on how to play many of his compositions and descriptions of his emotional state and day-to-day life, all of which are priceless to the modern interpreter. During Beethoven’s life, the piano as an instrument became much more accepted as an instrument, partly due to technological enhancements that meant a piano could hold its own with a full orchestra whilst retain its warmth, tone, sustain and power in the chamber setting. The harpsichords, spinets, and clavichords of the past would eventually lose popularity among composers and audiences. The timing could not have been more perfect for Beethoven; he would become a master at both performing on and composing for the piano. He is usually regarded as having composed five piano concertos, although his piano arrangement of his Violin Concerto in D Major is sometimes referred to as his Piano Concerto No. 6. Beethoven was a prolific composer of piano sonatas; altogether there are 32 of them, and many are well known, even among people with no interest in classical music. His best-known piano sonatas are “Moonlight”, “Waldstein”, “Pathétique” and “Pastoral” (not to be confused with his Pastoral Symphony). He also left copious amounts of chamber music, much of which had a piano (or more than one piano) as an integral part, along with his string quartets, duos, and quintets. In 1779, a composer, writer, teacher, and dreamer named Christian Neefe arrived in Bonn, Germany, to work for the Electoral Court. Neefe (pronounced nay-fuh) was the definition of what Germans call a Schwärmer, a person swarming with rapturous enthusiasms. In particular, he was inflamed with visions of endless human potentials that the Scientific Revolution and the Enlightenment promised to unleash. Like many progressives of the time, Neefe believed that humanity was finally coming of age. So he had picked the right place to get a job. Bonn was one of the most cultured and enlightened cities in Germany; the court supported a splendid musical and theatrical establishment. Before long in his new post, Neefe found himself mentoring a genius. Meanwhile, in his spare time, he signed on with a plan to, as it were, rule the world. One of Neefe’s first students was a sullen, grubby, taciturn 10-year-old keyboard player named Ludwig van Beethoven. He was the son of an alcoholic singer who had more or less beat music into him. The kid seemed more like a charity case than a budding musician, but Neefe soon discovered that his talent could put him in the league of the musical phenomenon of the age, a child of freakish gifts named Mozart. For the world today, the two most famous classical composers are surely Mozart and Beethoven. In this article, we're going to take a close look at the personality of one of those composers - Beethoven. His life story, trials, and tribulations make for very interesting reading and backed by the soundtrack of his music shows him to be a true and rare genius. It is widely known that Beethoven had a strong personality and by the first-hand accounts of many of his peers, was rather difficult to get along with or indeed understand. No doubt the great man's deafness and his obsession with hiding the fact contributed to his seemingly strange and obstinate behavior. Through his music, it is clear for all the world to see that he was a man of high and noble thoughts and ideals although his personal treatment of many of his peers especially critics and moralists was scathing, to say the least. Noted for being a stubborn man his time spent living at the house of Prince Lichnowski's house enabled a select group of people to know him more intimately than most had before. He would frequently go against protocol and arrive late for dinner, not caring for time or the etiquette of punctuality. Many accounts also take note of his clothes and how he often would appear unkempt and unshaven. For Beethoven, being born a noble was of no real value whatsoever and should entitle you to little automatic respect, those were things a person had to earn through their conduct in life. The fact that his hearing had started to disappear while still young and with a bright future as a performing pianist ahead of him cannot be underestimated. In his efforts to hide his infirmity it no doubt gave rise to peoples opinion of him as being strange, awkward and a recluse. This fact above all else is responsible for so much of Beethoven's behavior in his later years especially from 1801 onwards when he finally accepted that his condition was incurable. Payo Perry is a well recognized online author. Beethoven was among the most famous classical and romantic music composers. He was born in December 1770, in a place known as Bonn, the capital of Electorate of Cologne and a part of Roman Empire. Ludwig was born in a family deeply involved in classical music. His first music teacher was his father Johan Van Beethoven. By the age of 14, he started to work as an assistant organist in a court. While he was working for Christian Gottlob Neefe who was a member of Order of the Illuminati, Beethoven got influenced by the ideas of Freemasonry. A secret society criticized for working for devils and worshipping occults. In 1787 Ludwig's mother got sick and then died, following which his father went deep into alcoholism. Having no one to care for his younger siblings he had to stay in Bonn for next five years. In 1792, Beethoven left Bonn for Vienna where he learned playing music from Joseph Haydn and Leopold Mozart. In Vienna, Beethoven had to strive hard to conceive notable reputation in the musical industry. For the premiere of his first symphony, he hired the Burgtheater and presented his Septet, the First Symphony and Piano Concertos, along with some works of Haydn and Mozart. Soon after these achievements, Beethoven started to gain fame and eminence. In 1799, when Beethoven was teaching music lessons to Hungarian Countess's daughters, he started an affair with the youngest daughter, Josephine. But as soon as the Countess Anna Brunswick discerned this, she married her daughter Josephine with Josef Deym. The love between them didn't diminish and was accentuated again after the sudden death of Deym. Beethoven's hearing ability started to deteriorate by the age of 26, it is said that he suffered from a severe form of tinnitus, typhus or some sort of auto immune disorder. He was used to writing letters to his friends and doctors, in which he wrote about the pain and agony he was facing but nothing would help. His ability to hear gradually decreased until 1814 when he completely became deaf. Although Beethoven had lost his hearing ability, he didn't quit playing music. One of the famous incidents is when he blatantly started to cry before the audience due to his inability to hear the applause after his ninth symphony. He continued to have public concerts until the 24th of May 1824 when the concert was attended by few and nothing went well. Josephine had already married another commoner and Beethoven was left alone. After a long sickness and bed rest of two months, he died in March 1827. The autopsy revealed that he died of liver damage and auditory dilation due to excessive intake of alcohol. His name as one of the best classical music composers will never be forgotten in the world of classical music. Isabella Victoria is a professional writer and providing services on music composers, and on classical music. Beethoven is not a new name to the world of music. For the music buffs he is an inspiring icon. Beethoven's musical genius has inspired generations and is continuing to do so. He immortalized himself in the world of music with his sonatas. He composed music for operas, sonatas, quartets, pianos, violin concerts and orchestras. The talented musician's famous compositions are the Moonlight sonata, Fur Elise and Fifth and the Ninth symphonies. Beethoven was born in the year 1770, on the 16th day of December in Bonn, Germany. Coming from a family of musicians, he showed his inclination towards music, even when he was young. He was gifted in music even as a child, and began performing in public at the tender age of six. He became a professional at the age of 13. He had to fight hearing impairment but emerged brave by countering the problem and composing beautiful tunes. The illustrious musician died at 56 but he still lives on, through his wonderful music. Such is the genius of Beethoven. Beethoven composed over thirty two piano sonatas and each of them is considered to be a precious treasure in the world of music. He played a pivotal role in the evolution and transformation of the sonata form. Many traits followed by his predecessors like Mozart and Haydn were sustained in his sonatas but he projected his personality and emotions through them and made sonatas, an impressive art form. The tonality is the fundamental principle on which Beethoven's piano sonatas are organized. Beethoven considered tonality vital for understanding any kind of musical form. In the thirty two sonatas composed by him, twelve of the sonatas have four parts, thirteen comprise three parts and remaining seven sonatas consist of two parts. A significant aspect of the Beethoven's Sonata is the distinguished diversity of the movement types and the succession order. The distinct feature of his sonatas is the diligence with which he creates a connection between the constituent parts of the Sonata. The piano Sonata No. 14 in C-sharp minor by Beethoven is known popularly as the Moonlight Sonata. He completed the sonata in the year 1810. During the composition of this piano Sonata, Beethoven began to lose his hearing faculty. He used a custom made rod that was attached to the soundboard of the piano. This helped him to sense the vibrations. The name of the sonata is 'Moonlight Sonata' since it is compared to moonlight which shines on lake Lucerne by a music critic, Ludwig Rellstab. Beethoven's Sonata No.8 in C minor is called Pathetique. In 1799, this piano sonata was published. The work was dedicated to Prince Karl Von Lichnowsky, his friend. The beauty of the sonata is its tragic sonorities. The sonata has been performed in concerts and recordings frequently, owing to its popularity. The musical theme of Beethoven's Sonata allures the listeners. The musical theme in his compositions becomes a concept that pervades throughout the composition. Beethoven's piano sonatas are played by both amateurs and professionals alike. His compositions are performed by pianists worldwide and are even recorded extensively. The gifted musician has reflected his sorrows, joys and all kinds of emotions through his compositions. How else do you describe music? Is it not a channel to describe yourself, your emotions? His brave fight against the odds like his hearing disability did not stop him from composing and playing beautiful music. Playing his sonatas on a piano is like reading the life of this gifted and illustrious musician, full of all the colors and hues of human life - full of music - full of...Beethoven. Beethoven was born in Germany. His family were musicians. His family was not rich. Because his father was a poor provider, Beethoven's family got a little bit of financial help from Beethoven's grandfather. Beethoven didn't learn very well at school and his family couldn't afford to send him to a good school. Beethoven had to live under a cloud of shame due to his father's bad reputation. Beethoven also lived under his fathers pressure to make him into a famous child prodigy like Mozart had been. As a young adult, Beethoven studied with a famous composer called Haydn. They didn't get along so his lessons ended. He also taught some pupils that became famous musicians too. In his 20's Beethoven also moved away from Germany to Vienna. When he moved away his father died. Beethoven wrote many great compositions and managed to impress the right people at various court concerts. Also, in his 20's Beethoven started to go deaf, affecting his social and work life. Beethoven died of Oedema (excess water and swelling of the body) when he was 56. However doctors back then weren't as informed at making diagnoses and doing autopsies- so there were probably other health problems that contributed to his death too. Beethoven had a difficult personality and would often openly insult people and burst into fits of anger. He couldn't ever commit to a woman or have a normal relationship. He was attracted to women, but only really loved one woman who left him after some time to marry someone else. He never got over her and always loved her. When Beethoven's brother died he adopted his nephew. However, the relationship wasn't very good. They often fought and his nephew even tried to commit suicide. On top of the stress with his nephew, in his later years Beethoven had financial stress. Even though Beethoven still had work, his cashflow was not reliable because of the financial difficulties of his patrons who themselves were experiencing dwindling finances. If you take the time to listen to Beethoven's music it will open up a world of emotions that can't be explained in words. Beethoven agonised over his compositions and was a perfectionist. He also lived in a time of great social upheaval- the time of Napoleon Bonaparte. His works express everything from personal feelings of longing and frustration, to his desire to support or denounce the vast political and social movements which he lived through. He broke the rules of musical composition by changing the structure of his pieces and he was equally as talented at composing for orchestra's as he was for solo piano. Beethoven was certainly a unique person to be living in that time and this is what made his music so famous. Go onto YouTube or iTunes and listen to Beethoven's music. Research when his works were written and try to match it to what Beethoven was doing at that time in his life. Was he full of hope and adventure, having just arrived in Vienna? (such as in his early years)... Or was he despondent and disillusioned? (such as in the years leading up to his death). Visit [http://www.pianoplayerperfecter.com] to build your own individual, perfected musical style! Let's put aside everything that we've been told about Beethoven and consider this question. It's an ugly question that will probably provoke aggression, but it is nevertheless interesting. What is the evidence that Beethoven was deaf? Scrounging through literature and websites shows many anecdotes, letters, and references to an autopsy report (of which the original has been lost). It looks pretty promising, however, we really can't definitively say whether or not it is authentic. This is where this post begins to sound like a conspiracy theory, but rest assured, I'm only trying to use an example to ask a larger philosophical question. Beethoven's biggest legacy could be his development of the idea of how we think of artists. His music broke the classical boundaries and originated the idea of the brooding, highly individual artist (as opposed to the former artisan status of composers). At the time, his music was very avant-garde and widely criticized. That's not to say that his music was bad, it was arguably pretty amazing, however, it wasn't what people were used to, and in order for people to accept progress, they need to think that it's worth their time to do so. This is where it gets interesting. For arguments sake, let's say that Beethoven was a genius. The problem posed to him was: How do I get people to give this music a chance? Imagine you are a 19th century citizen. It is a Friday night and you're looking to go out and have a good time. You hear that there is a concert being given with some new Beethoven piece. You're slightly interested. Then you hear the rumor that Beethoven's gone deaf... What? At this point, you are fully interested. You feel compelled to go, even if it's just to laugh at the chaos of the music. That is exactly the type of person that Beethoven's music would snare. Their minds would be open and without expectation for normal classical era music. What happens when you go to this concert and the music is actually really good? It is human nature to love stories of brave people overcoming tragedy, therefor people would want for his music to be good and would be more likely to pay attention and accept his eccentricities as genius. Beethoven was notorious for stopping concerts if he felt he wasn't being given full attention. Did his deafness not afford him exactly the attention wanted? One of the reasons that Beethoven's deafness could be viewed as an attention grabber is the way that he revealed his affliction to everyone. Whether or not his deafness was real, it is obvious that he was portraying himself as romantically as possible, trying to evoke feelings of sympathy or admiration for his courage in accepting every challenge life had to offer. I would say a wonderful example of this is the report of him having guests over to his house in 1814, whereupon he proceeded to play piano extremely loudly (that he may also hear), whilst remarking "Isn't it beautiful?". This apparently had a wonderful effect on the guests who felt a deep sympathy for him and his courage. Nice one. Another piece of evidence for his self-romanticization is in his letters in which he says things such as: "Live alone in your art! Restricted though you be by your defective sense, this is still the only existence for you" or my personal favorite "Perfect the ear trumpets as far as possible, and then travel; this you owe to yourself, to mankind and to the Almighty! Only thus can you develop all that is still locked within you;-- and a little court,--a little chapel,--writing the music and having it performed to the glory of the Almighty, the Eternal, the Infinite---". Oh what a tragic character he is. What makes it so much more charismatic is that it's a true story! The references to religion are particularly interesting. It gives him so much more power to say that he is driven by divine forces. It would seem as though he was trying to employ a gimmick or create a character for himself. Where would he have gotten an idea like this? Why was the timing for this "deafness" historically logical? The answer for both of these questions could be Mozart. The concept of Mozart is a perfect father to Beethoven's deafness. Mozart was also, to a lesser extent, a romantic character. His music is backed by a story. The story of a child genius, born only to compose and enchant. He was writing symphonies by the time he was 8. Wow! It didn't matter that the music was bad, people didn't care about the music, they cared about the story. His father was also a musician, so who knows how much of these early works were actually Wolfgang. I'm not trying to say that all of Mozart was a sham and that he's a worthless composer, just that he was founded on a gimmick. His later music is actually quite good. Nevertheless, the gimmick was quite successful and everyone wanted to see the freak of nature that was Mozart. The idea of the child genius caught on and many people tried to replicate it exactly. Beethoven, a huge fan of Mozart, could have seen this gimmick and wanted to have his own. Thus the age of gimmicks (that is still alive today) was born. The gimmick is such a powerful tool in art. Beethoven's legacy has proven this to us. Ask anyone today about Beethoven, and you will just as likely hear a reference to his deafness as to an admiration for any particular piece. In fact, I would argue that the average person would know Beethoven only by his deafness. To demonstrate the power of the gimmick, imagine showing a person the second movement from Beethoven's Moonlight Sonata. It's a beautiful piece to be sure. Imagine their expression when you tell them that it was written by a deaf composer and that it saved him from suicide. Just then, the piece transforms from a beautiful piece to a compelling testament to the triumph of human perseverance. Although it's only a partially true statement, the effect that it has on the listener is enormous. My question here is: If backstory can create such a powerful effect, why would a genius such as Beethoven not seek to employ is strategically?